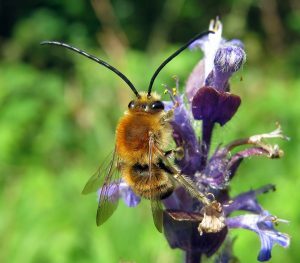 Long-horned bees get their name from the males’ unmistakable and unusually long antennae. Sadly, this species has declined significantly across Britain and is now absent from many of the southern counties it used to be found in. As a result, it is considered a UK priority species. Females lack the extra-long antennae, but are otherwise similar to males, with a bit of a sturdier, more robust frame. 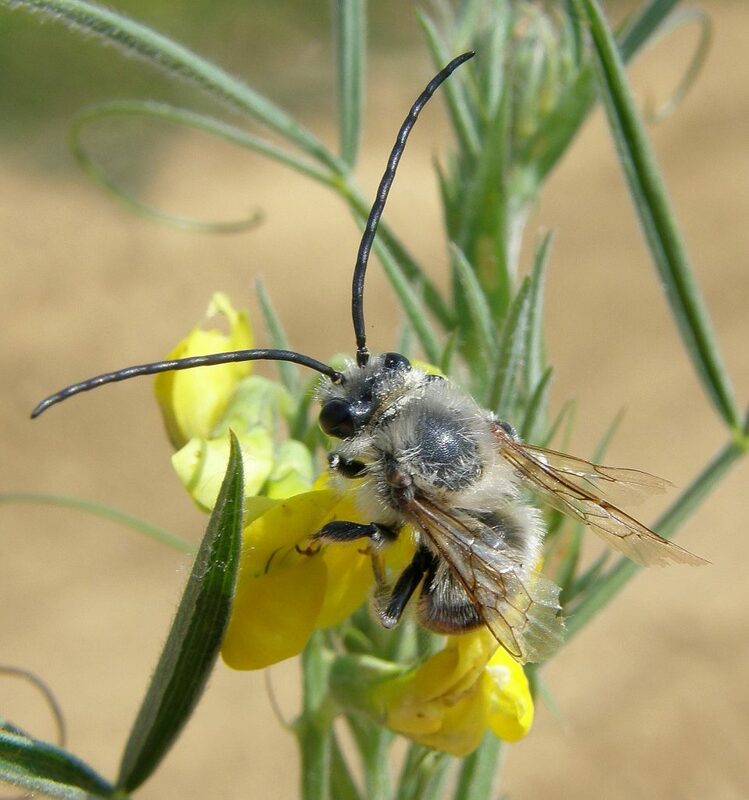 They can be confused with some Flower bees (Anthophora species), although they can be separated by examining the wing structure (See Falk & Lewington Field Guide for details). Males are instantly recognisable by their long antennae. Their thoraxes are covered with light brown hair, and their abdomens are also sparsely covered with light brown-haired. Their hair can fade to a silvery white when exposed to the sun. These bees are known to occur in a variety of habitats, including coastal grasslands, soft cliff faces, heathland edges, woodland rides and clearings and sometimes brownfield areas. They will feed on a wide variety of flowers including bramble, bugle and comfrey, although they seem to have a special preference for members of the pea family like clovers, vetches, bird’s foot trefoil and everlasting peas. Males emerge first in mid-May, females are on the wing a couple of weeks later and can be seen until August. They are now mostly found in a small number of locations on the south coasts of England and Wales with some inland populations near Shropshire. 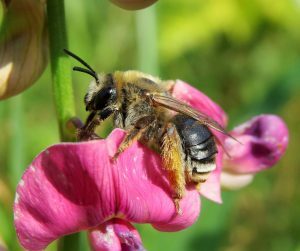 Male Long-horned bees are often deceived by Bee orchids (Ophrys species). These flowers not only look like bees in shape, colour and size, they also emit pheromones to trick unsuspecting males into thinking they are a potential mate.